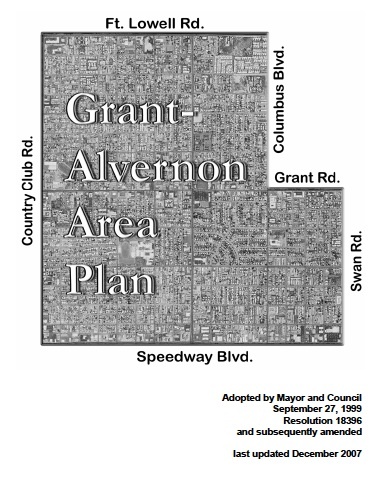 The Grant/Alvernon Plan was developed in 1999 by the neighborhoods surrounding the Grant and Alvernon intersection. It was written to help guide development and growth in our area, especially in terms of density and land use. The City will be requesting modifications to the plan in order to do a Zoning Overlay on Grant Road when RTA construction begins. When it states the plan was updated in 2017. That is the last time a variance was granted. Garden District is trying to be proactive. Change is inevitable. The possibilities for the changes on Grant are exciting. We are organizing and trying to get everything in place to have a louder say, a stronger voice. We don't want to stop development. We do want to have a say in what that development is, how it will look, and how it will impact us as neighbors and residents in particular, as well as the larger Tucson community. If you would like to communicate your vision and dreams of what our neighborhood will grow to be and volunteer a few hours to help shape the future of Garden District, there are many ways to participate. We will be communicating about the process and giving opportunities for input through the e-newsletter, via email, and with meetings.